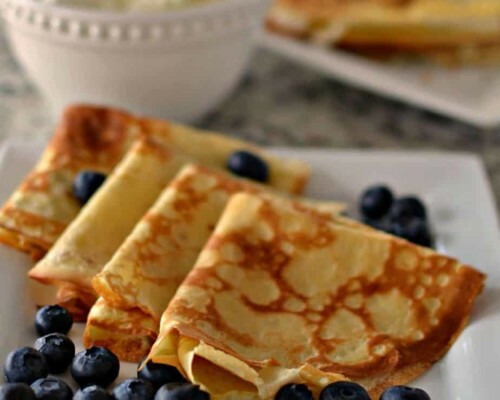 Have you always wanted to make homemade crepes but felt intimidated by those fancy brunch chefs that whip them up right in front of you? After all they have a special pan and tools. No worries my friend. 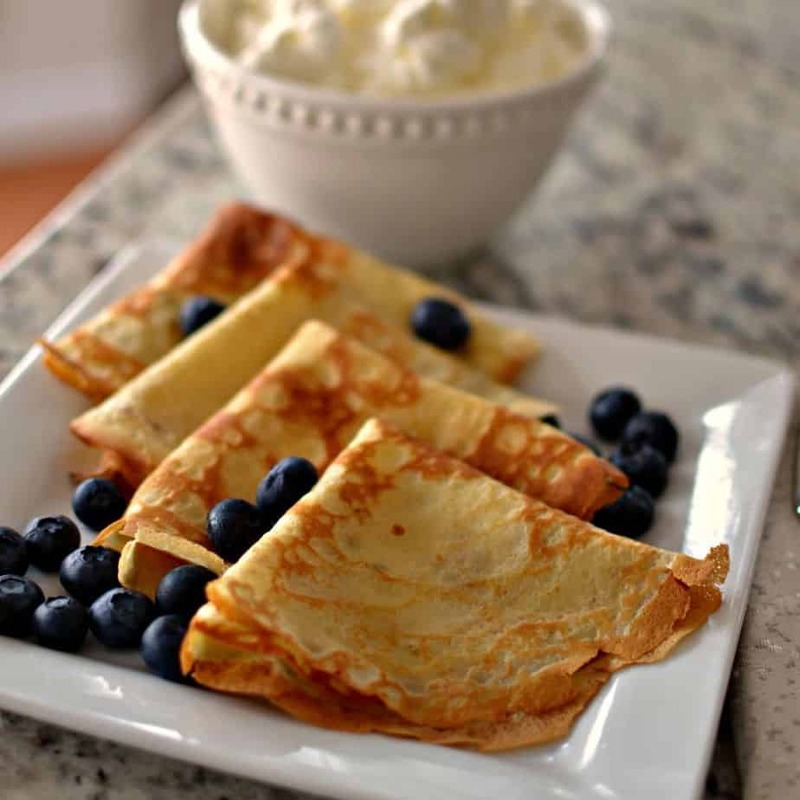 Crepes can be made in a standard nonstick skillet and turned with a thin spatula. I use my slim cookie spatula. 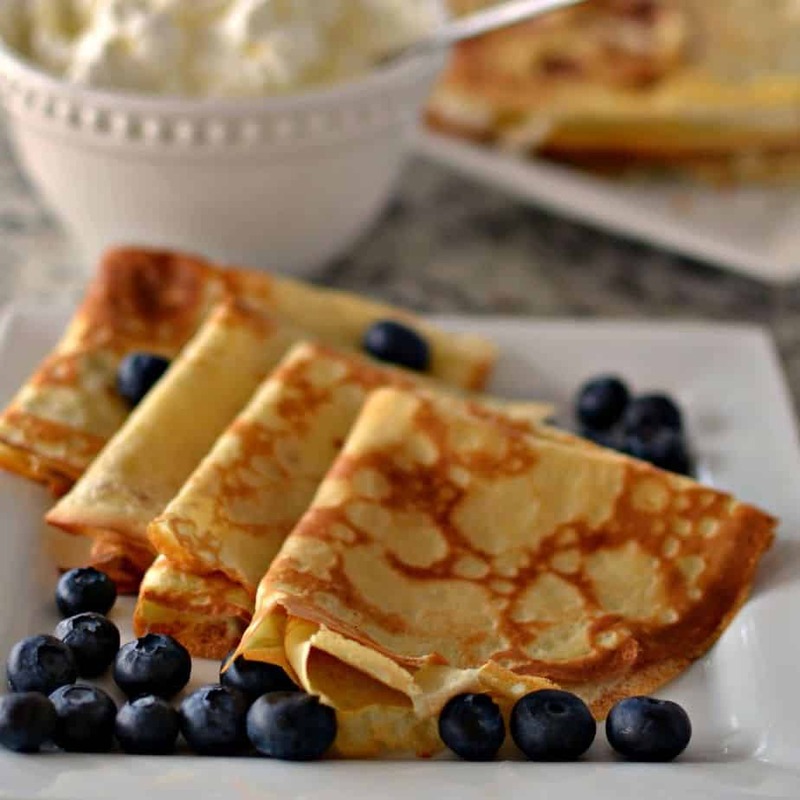 This delicious crepe recipe is made with six ingredients in a blender. It takes about five minutes to add the ingredients to the blender and mix it up. A crepe is like a flat pancake. 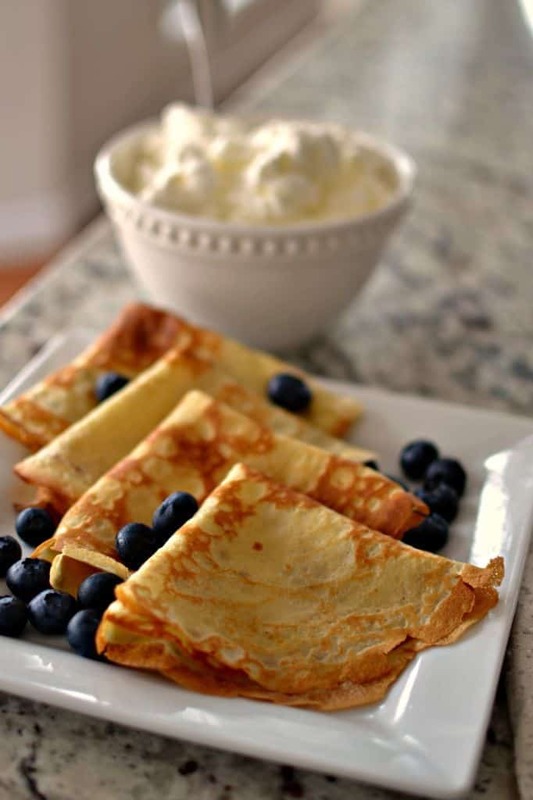 Unlike a pancake a crepe does not have a leavening agent. A small amount of batter is poured in a heated lightly buttered skillet and swirled till the ending result is a very thin unleavened pancake. They can be served warm or cold , savory or sweet, for breakfast or dinner. 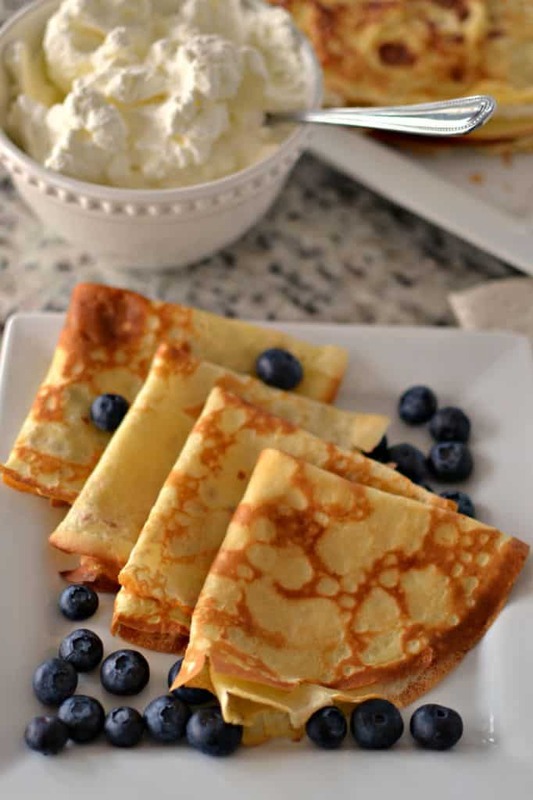 This Easy Crepe Recipe could not be any easier. First add the milk, eggs, sugar, salt, melted butter and flour to a blender. Blend for just a couple of seconds. If necessary scrape down the sides of the blender and blend for one to two more seconds. Refrigerate for thirty minutes to one hour to allow the bubbles to subside. This aids in preventing tears in the thin crepes. Then heat a nonstick skillet over medium heat. Melt a small amount of butter in the skillet. Use just enough butter to lightly coat the skillet. Pour about one quarter cup of batter into the pan and swirl to coat evenly. Cook for a little less than one minute, flip and cook the other side for about thirty seconds. They should be lightly browned. 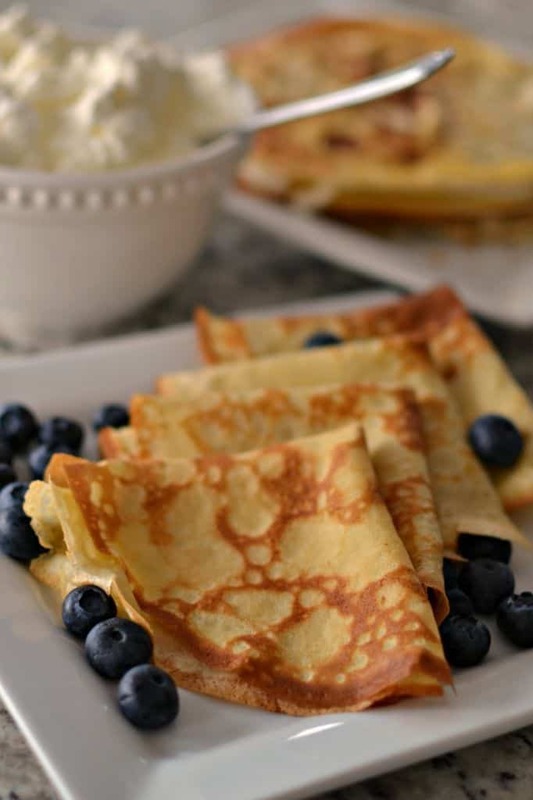 Helpful hints on making this Easy Crepe Recipe. Don’t over mix the crepe mixture. Just a couple seconds on a medium low speed will do the trick. Over-mixing will make the crepes tough. Don’t skip the resting time for the crepe mixture. Cover and place in the fridge. This step is important as it aids in less tears in the crepes. All you need is a very small amount of butter. Just enough to coat the bottom of the pan. When swirling the batter work quickly using your wrist to move the pan and coat as evenly as possible. Don’t overcook the crepes. Things move very quickly. Now is not the time to call your Grandma. How do I serve crepes? Do crepes need to be stored in the refrigerator? Yes they do. Once cooled they can be stacked together on a plate, covered with plastic wrap and stored in the fridge for up to five days. Yes they most certainly can. Fully cool the crepes, place wax paper between each crepe and on the bottom and top of the stack. Place the stack in a freezer bag carefully removing as much of the air as possible. Place the freezer bag in a sturdy freezer ware container. Freeze up to two months. Thaw by placing the freezer bag in the refrigerator. Other sweet breakfast recipes you will love! This Easy Crepe Recipe is made with six ingredients in a blender. You can mix it up to a day in advance and store in the refrigerator. Add milk, eggs, melted butter, sugar, salt, and flour to a blender. Blend for 2-3 seconds. Refrigerate for 30-60 minutes. Heat a 10 inch nonstick skillet over medium heat. Melt 1/4 tablespoon butter in the skillet. Pour 1/4 cup of batter into the pan and swirl to coat evenly. Cook for 1 minute; or until lightly browned. Flip and cook the other side for 30 seconds; or until lightly browned. Totally making these this weekend! Will you please post or email the white cheddar sauce re ipe?I would love to try this. To be honest Debbie I am not sure what you are referring to. Are you talking about white queso dip? 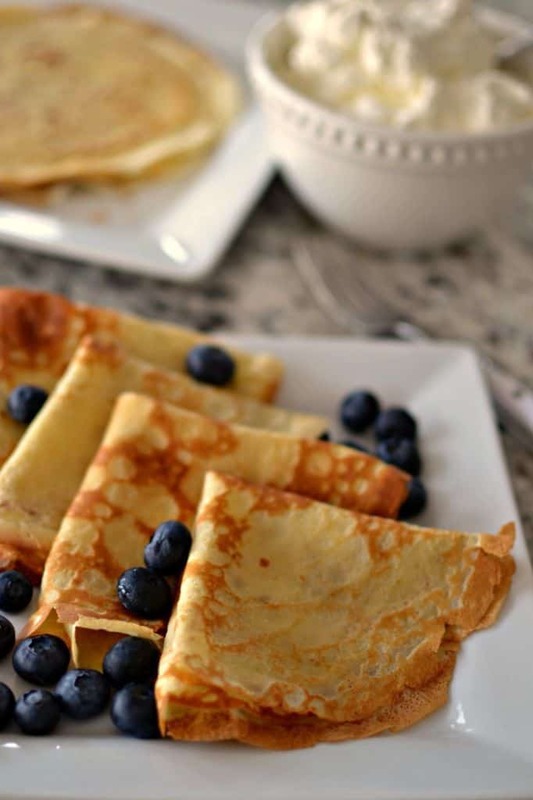 These crepes are the ideal brunch recipe! Thanks for a great crepe primer. Making crepes has been on my bucket list for a long time! Thanks Mallory! I hope you enjoy them! We always get crepes when we go the boardwalk during the summer. Can’t wait to surprise my kids with these at home now. They look so good. These crepes turned out beautiful for breakfast this morning! Thank you! My kids loved these!! A new favorite breakfast in my house!